Quasar 3C 454.3 is a violently variable object located in Pegasus, 2.7° WSW of Alpha Pegasi. 3C 454.3 is a high polarization quasar (HPQ) and one of the most violent variable sources in the sky. The strong variability ranges from radio to gamma wavelength. This OVV is very active with a total range of about 5 magnitudes (!) in the optical. The optical events show fast, spike-like flares with sharply raising and falling fluxes. 3C 454.3 was discovered as a radio source during the 3. Cambridge Radio Survey (3C) in 1959. Since then, this quasar has been cataloged by several other radio surveys (e.g. 4C, PKS, 87GB, TXS). In the early 1960s, a faint blue stellar object of 18-mag was found as the optical counterpart, which turned out to be variable in both radio and optical wavelength. The first reliable redshift of z=0.859 was measured in 1967, which corresponds to a light travel time of nearly 7 Gyrs. 3C 454.3 has also been detected as an X-ray source since 1980 and as a source of gamma-rays since the early 1990s. Quasar 3C 454.3 is a violently variable object with a total range of about 5 magnitudes in the optical. For visual observers with a 10- to 12-inch telescope or larger this is a difficult target, as it will only be visible during active state. 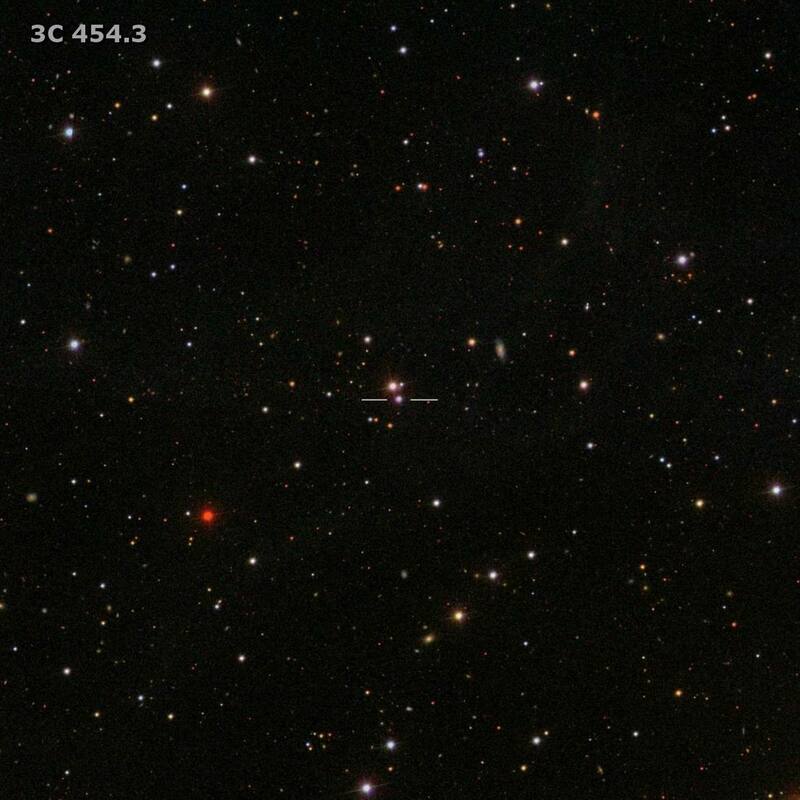 3C 454.3 appears as a stellar object even in large aperture telescopes. CCD observers, as well as visual observers, shall use the comparison stars given above. Other photometric sequences were published by Angione (1971), Raiteri et al. (1998) and Smith et al. (1998). Quasar 3C 454.3 is located in Pegasus, 2.7° WSW of Alpha Pegasi, also known as Markab. Turning the telescope 4.6° to the SE shows 11.7-mag NGC 7479, a very interesting face-on spiral with two prominent extended spiral arms. The core of NGC 7479 is also known as an AGN with Seyfert-1 spectrum. By heading 5° further to the SE we reach the Pegasus-I galaxy cluster, which is dominated by the two bright ellipticals NGC 7619 (12.1 mag) and NGC 7626 (12.2 mag). A 10-inch telescope at high powers shows about 8 additional members of Pegasus-I galaxy cluster. Finally, one deep sky showpiece in southern Pegasus shall not be missed: globular cluster M15. This 6.2-mag globular is one of the brightest globular clusters in the northern sky and is located some 20° WSW of 3C 454.3. M15 appears bright and large with a very dense core. Inside M15, large aperture telescopes may reveal a very special object: Pease 1, a faint planetary nebula, only 3” in diameter. A more challenging deep sky object is another quasar, MRK 304, a bright 14-mag object at a distance of about 0.8×109 light-years, 9° WSW of 3C 454.3. Angione, R.J. 1971, AJ, 76, 412; Photoelectric Sequences for the Brighter QSO´s. 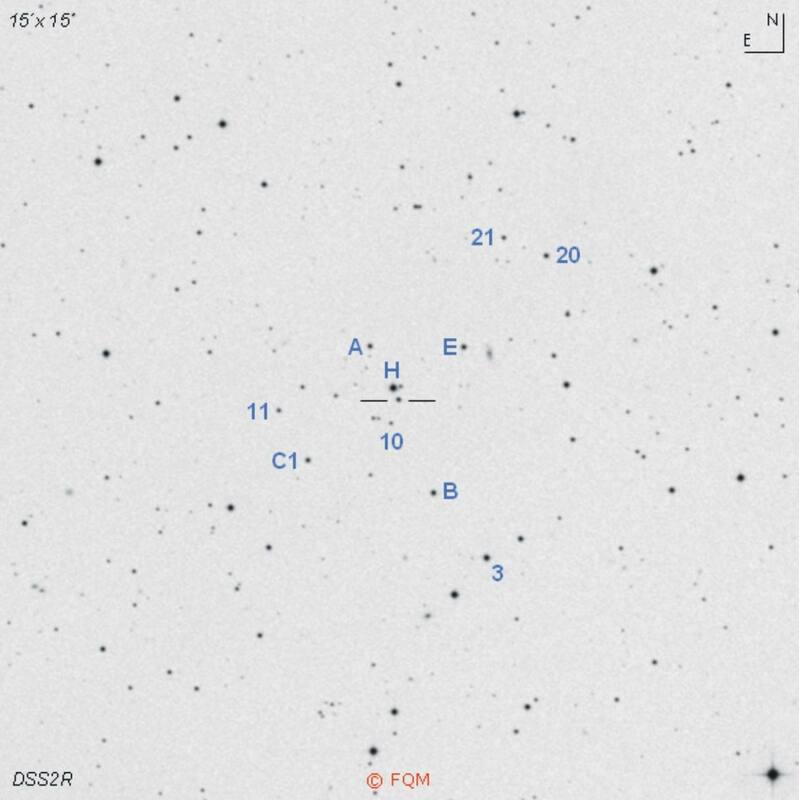 Fiorucci, M., Tosti, G., Rizzi, N. 1998, PASP, 110, 105; VRI Photometry of Stars in the Fields of 16 Blazars. Network of faint Stars calibrated on the Landolt System. Lynds, C.R. 1967, ApJ, 147, 837L; New Spectroscopic Observations of Twenty Quasi-Stellar Sources. 3C 279, and Other Radio Sources. Raiteri, C.M., Villata, M., et al. 1998, A&AS, 130, 495; BVR Photometry of Comparison Stars in selected Blazar Fields. II. New Redshifts and New Identifications of Distant Galaxies. Steinicke, W.; Katalog heller Quasare und BL Lacertae Objekte; Umkirch 1998. Tananbaum, H., Wardle, J.F.C., et al. 1983, ApJ, 268, 60; X-ray Studies of Quasars with the Einstein Observatory. Villata, M., Raiteri, C.M. 1997, A&AS, 121, 119; Optical Photometric Monitoring of Gamma-Ray Loud Blazars. I. Observations from November 1994 to November 1995.